Building St. John's Church, 1911. Kate & Joe McGuire, Ursula Lampert, Irene Ableidinger, Mary Lipetzky and Opal Ableidinger gathered at McGuire's and filed some notes for this account in 1976. Two years before the turn of the century, 1898, Rev. J.A. MacDonald came to Kensal from Carrington to care for the spiritual needs of the local Catholics. In due time the Rev. Wm. Gallahue from New Rockford assisted in the same duties. The mission mass and prayers were offered in the upstairs meeting room of Richard Feckler's store. This building was later identified as Olaf Ekren's implement store. You youngsters probably recall watching it go up in flames in the fall of 1972. The first altar boys were George Nogosek and Art Brewer. Two altar boys of slightly later time were Lou Nogosek and Max Feckler. A public school building, which had been constructed in 1896 on the lot east of Mrs. Engel's. home today, having become inadequate, for educational needs, was purchased by the local parishioners in 1904. Then regular Sunday mission services were offered by Rev. Anthony B. Woeste, Rev. Gerard C. Biesens, Rev. J.A. MacDonald, and Rev. Peter McGeough. John and Mary Lipetzky, newlyweds, who traveled to Kensal by the Soo Line Railroad to establish their first home in the year of 1915, had a pleasant surprise when they attended Mass in Kensal on Sunday. The young priest, who had been riding in the same coach in which they had ridden and who had departed from the train at Wimbledon, officiated at the Sunday Mass. This priest, Father Peter McGeough, one of the mission priests, became the resident pastor in 1917 and served here unti11925. The first baptisms officially recorded in St. John's Parish record books included: Thomas Richard Neva, son of Andrew Neva; Cecelia Neva, daughter of Anton Neva; Roman Anton Neva, son of Andrew Neva (now known as Father Roman Neva); Francis Brewer, son of Walter Brewer; Nellie Ableidinger, daughter of Ambrose Ableidinger. The first baptisms officially recorded in St. John's Parish record books included: Thomas Richard Neva, son of Andrew Neva; Cecelia Neva, daughter of Anton Neva; Roman Anton Neva, son of Andrew Neva (now known as Father Roman Neva); Francis Brewer, son of Walter Brewer; Nellie Ableidinger, daughter of Ambrose Ableidinger. The first wedding recorded in St. John's Parish records in 1909 was Wm. Koenig and Annie Pientock. Witnesses were Frances Lonski and Robert Koenig, who later became Mr. and Mrs. Robert Koenig. Our Catholic ancestors knew the school building which they had purchased would not be spacious enough for their future needs. By 1910, $10,000 had been donated and saved for the construction of the large, new Catholic Church which was built south of the Thomas Nihill residence. Nine years later, 1919, it was necessary to enlarge the church so it was moved to the location just west of this new brick church. Then twenty feet were added to the moved church. With a winch pulled by two strong, well-trained horses, Grant Partlow, the local livery proprietor moved the structure to the location just mentioned. This was the Catholic place of worship until it was dismantled in 1968. Joe McGuire remembers well the moving of the church to its last location because he (the naughty little boy) threw stones at the horses because he thought it was fun to make the men who were resetting the winch, run and work faster. The last baptisms in the old church were: Ruth Kulla, daughter of Pete Kulla; Brian Joel Paczkowski, son of Darwin Paczkowski. The last wedding in the old church was that of Susan Johnson and Dave Christopherson on June 22, 1968. The priests who have guided, led and instructed the Catholics of this parish through the years were. I understand, after Father Zimmerman officiated at Ursula Paczkowski and Gordon Lampert's wedding, he felt he had completed his duties here and left for Karlsruhe, N.D.
Father Moore deserves much praise and credit from us. If he hadn't realized the need of a new church in the future, this day of mortgage burning would not be June 13, 1976, but a much later date. With friendly persuasiveness and persistence he convinced the parishioners to initiate and set aside a savings account toward accomplishing this goal, the new church. Therefore we had an $87,000 fund when the actual work on the building started. Again, thanks to Father Moore! We were all sorry he was not able to stay and assist us with the project. 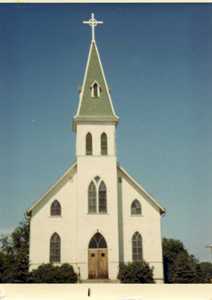 Before the church was completed Father Moore was transferred to Grand Forks. 1967-1968 - Rev. Robert Benson. The new structure was dedicated October 13, 1968. Bishop Leo Dworschok offered the Mass at 3:00 pm. We served a dinner at 5:00 pm for all visiting clergymen, parishioners and visitors. The first wedding in the new church was Ramona Hoggarth and Robert Pederson in September 1968. Kurt Darwin Kramer has the honor of being the first baby baptized in the new St. John's Church. He was baptized on November 21, 1968. The new St. John's Catholic Church 1968. This day of mortgage burning means we have the new $140,000 structure and furnishings paid up! The $41,000 we had borrowed toward the goal, plus interest, has now been paid. Thanks to all the people who have made donations. Rev. Robert Branconnier, our parish priest since 1975, is very busy serving in the spiritual needs of Catholics in Bordulac, Courtenay and our St. John's Parish. Rev. Branconnier's mother needed his help after his father died in 1977, so we had a priest from Poland, Father Felix Lubas, who served until 1982. Father Neal Kapaun is the present priest coming from Wimbledon to serve our religious needs. In November 1904 James Moody Watson deeded 2 acres of land one mile north of Kensal to Rev. John Shanley. After having had several owners this land became the property of August Lipetzky who gave it to St. John's Catholic Church for a cemetery. By 1915 there were seven graves there. In 1940 an additional piece of land was donated to the cemetery by the Lipetzky Estate. In 1949 it was decided to organize a group to look after the upkeep of the cemetery. These ladies Mary Lipetzky, Kate Lipetzky, Irene Ableidinger, Agnes DeVillers, Maureen Nogosek and Therese Nogosek with the help of Father Moore went ahead with the plans. They contacted families, raised money to purchase lawn equipment and plantings and were on the way to making a beautiful cemetery. In 1982 much more work was done on the grounds. The cross was moved to the far east, new gates were installed and flower beds along the fence were made. They now have regular upkeep and care and it is a beautiful place with its numerous plantings. The present cemetery board consists of Patty Neva, Vernette Neva, Donna Lipetzky, Sharon Neva and Ione Bredahl. They are now converting to a Perpetual Help Program. In November 1904 James Moody Watson deeded 2 acres of land one mile north of Kensal to Rev. John Shanley. After having had several owners this land became the property of August Lipetzky who gave it to St. John's Catholic Church for a cemetery. By 1915 there were seven graves there. In 1940 an additional piece of land was donated to the cemetery by the Lipetzky Estate. The present cemetery board consists of Patty Neva, Vernette Neva, Donna Lipetzky, Sharon Neva and lone Bredahl.